The first of these events is the Dickens Christmas event on December 1 and 2 from Noon – 6 pm. This event will feature old-fashioned holiday fun in the festively decorated Sonnenberg Mansion and grounds. There will be live entertainment including musical and dance performances as well as a reading of the Christmas classic, Twas the Night Before Christmas. See the website for a complete schedule of the entertainment throughout the weekend. Horse drawn wagon rides will be available as well as being able to tour Sonnenberg’s Victorian mansion that has been decorated for the season. There will also be a “Smores Pit,” Christmas Carol scavenger hunt in the greenhouse, a light show on the South Lawn, and a “pop-up” gift shop. Christmas card photo opportunities abound so be sure to bring your camera! Admission is $7 and under 5 is free. Family friendly refreshments as well as wine by the glass will be available for purchase. All funds raised by this event directly support Sonnenberg Gardens. Attendees are encouraged to share the holiday spirit with others by bringing non-perishable food items to donate to Gleaner&apos;s Kitchen. The second event is the always popular Holiday Home Tour on December 8 from 11 am – 4 pm. This event showcases seven homes in the historic neighborhood adjacent to Sonnenberg. Each home has been festively decorated and is open to the public for tours. The eighth stop of the Home Tour is the festively decorated Sonnenberg Mansion. The tickets for the event are a booklet with info and images of the homes on the tour. The booklets are not mailed and can be picked up at anytime at the Sonnenberg offices, including the day of the show. Presale tickets may be purchased for $25 and for $30 the day of the show. Tickets may purchased online via the Sonnenberg Gardens website, over the phone 585-394-4922, or in person at both Canandaigua National Bank locations in Canandaigua, Sweet Expressions, and the Sonnenberg offices. 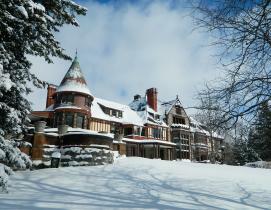 Sonnenberg Gardens & Mansion State Historic Park is one of America’s longest surviving estates from the Victorian Era. The elegant Queen Anne-style mansion was built in 1887 in Canandaigua by New York City financier Frederick Ferris Thompson, and his wife, Mary Clark Thompson, as a summer home. Between 1901 and 1920, the widowed Mrs. Thompson and her staff created the nine formal gardens seen today. The grounds are open to the public from May 1 through October 31 each year. Sonnenberg is a non-profit organization dependent upon the support of members and sponsors and its dedicated corps of volunteers. For more information on the revival of the grand estate on the “sunny hill,” contact Marketing Director Kimberly Burkard or Executive Director David Hutchings at 585-394-4922.